Mary’s Potatoes is The Best Potato Casserole ever! This spectacular potato casserole is similar to all the other Hash Brown Potato Casseroles that have gone viral over the web, with one main exception: it doesn’t call for cheese. It uses cream of chicken soup, sour cream, butter, diced onions, and is seasoned with salt, pepper, and parsley. It has a Ritz cracker crumb topping. 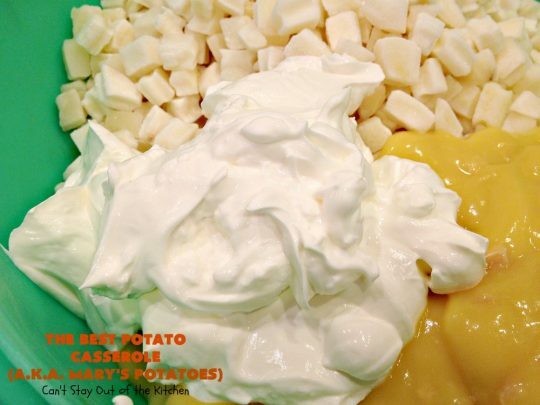 This is our family’s favorite way to make potatoes. It’s just so mouthwatering and delicious. Every time we serve it to company they also rave over it. I got this recipe from Ellen Brake who hosted us for lunch a few times when my husband preached in their pulpit during a period when their church was looking for a pastor. Mary was their teenage daughter (at the time) and she loved this potato casserole recipe requesting it often. After we tried it we could see why she enjoyed it so much, which is why I wrote the recipe down on the spot and have used this as our go-t0 potato casserole recipe ever since. 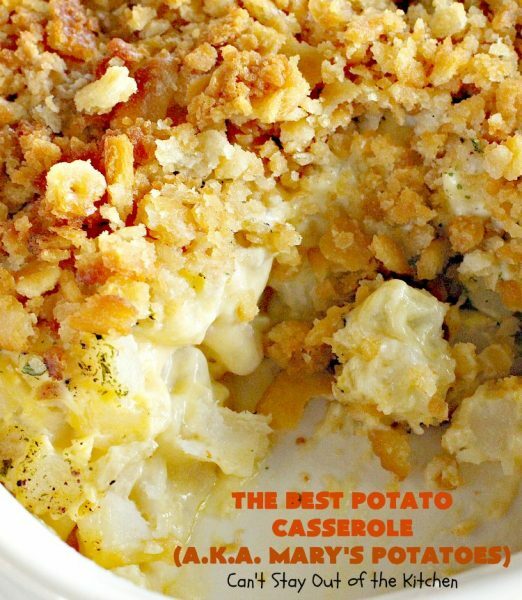 In honor of Mary, I titled it in my cookbook Mary’s potatoes. I think they called it Ellen’s potatoes (her mother’s name), but I chose to call it Mary’s potatoes. 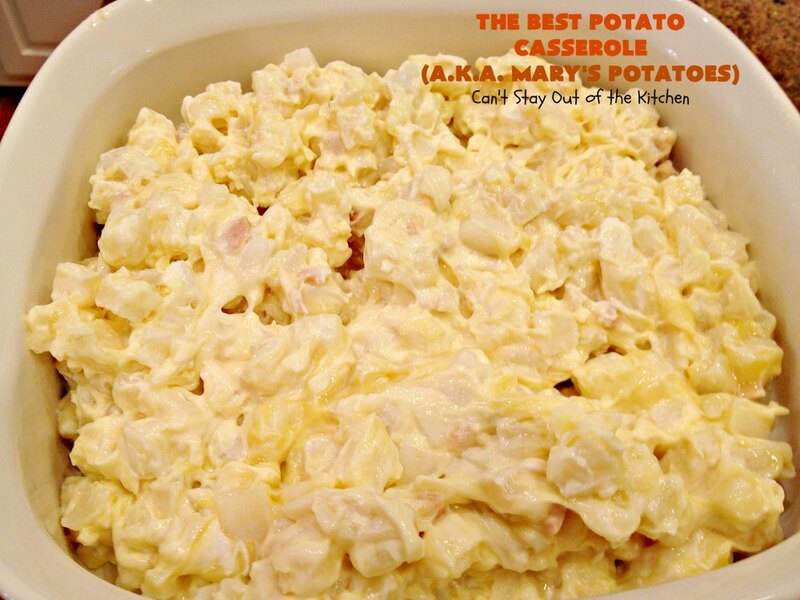 It truly is The Best Potato Casserole ever. 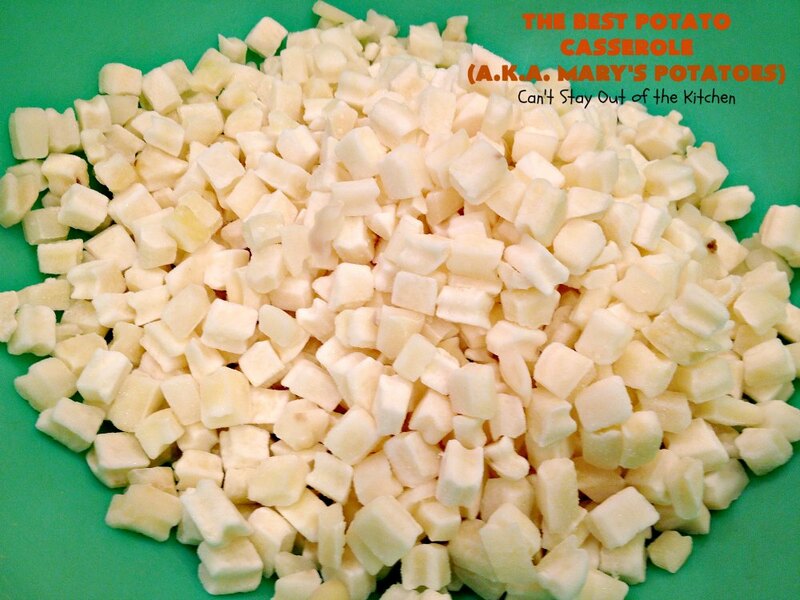 It is creamy and delicious and doesn’t need the cheese to have a wonderful flavor. I have used both shredded hash brown potatoes and country-style hash brown potatoes. They are interchangeable. 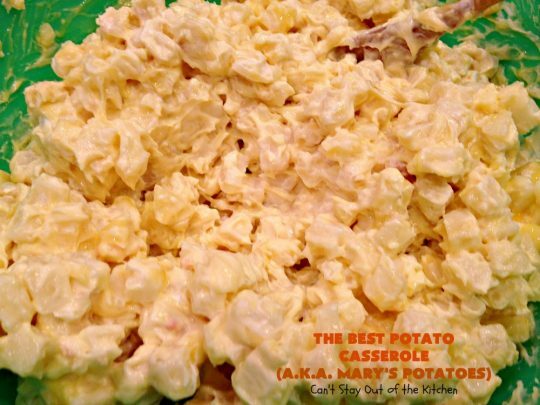 I have no idea who the creator of this recipe was but it wouldn’t surprise me if it was initiated by Ore-Ida potatoes, (by the way they have lots of delicious looking recipes on their website), Campbell’s soups or Ritz crackers since their products are stock ingredients in the recipe. If you’re looking for a fabulous side dish to serve your family or guests, than consider this savory recipe sometime. It truly is The Best Potato Casserole you’ll ever taste. The Best Potato Casserole is our favorite potato casserole recipe. 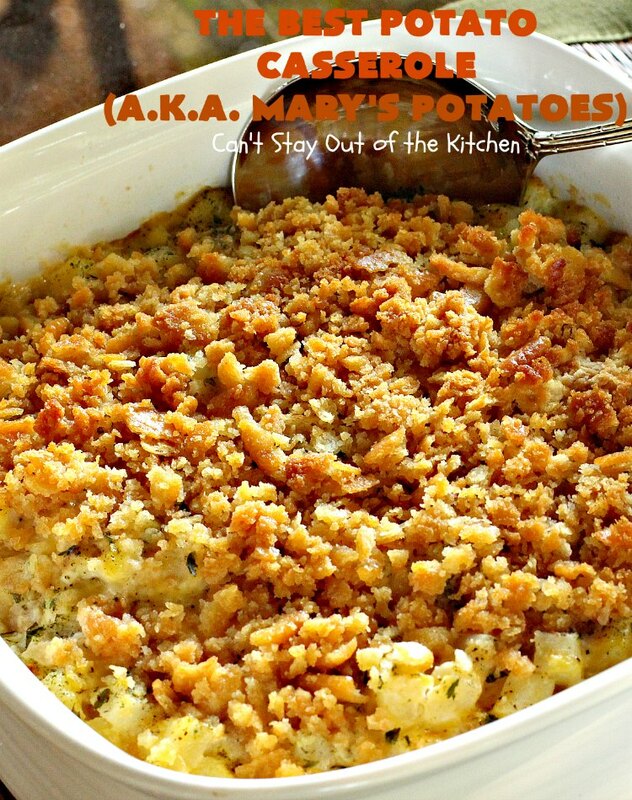 Mary’s Potatoes are simply A-M-A-Z-I-N-G!!!! 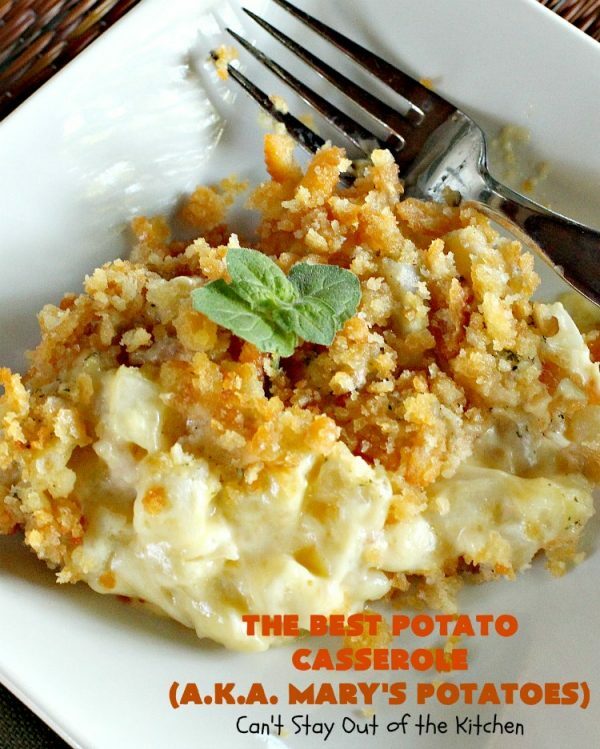 The Best Potato Casserole is very rich and satisfying as a comfort food – definitely NOT low calorie. You can see the creamy texture of this dish due to the cream of chicken soup, sour cream and butter in the recipe. Yum. Mary’s Potatoes is our favorite potato recipe, hands down! Start with a 32-oz. bag Ore-Ida potatoes – you can use country-style (like those pictured) or shredded hash brown potatoes. Either kind work well. Add two cans of cream of chicken soup and sour cream. Add diced onion and butter. Stir all the ingredients together with a large wooden spoon. 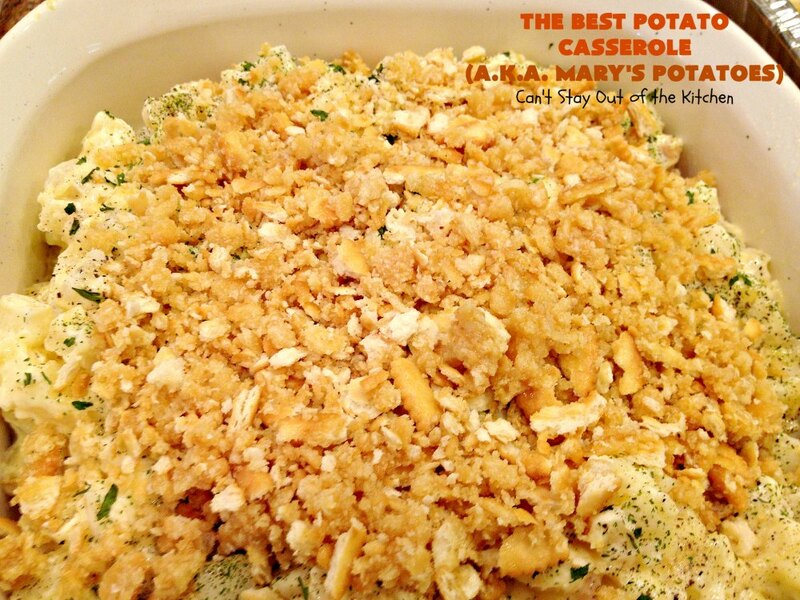 Spray a 9×13″ glass casserole dish with cooking spray. 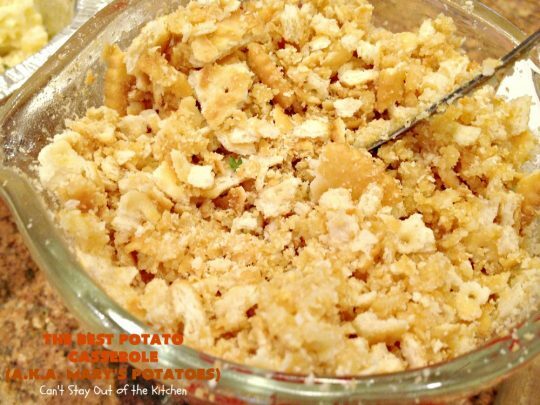 Spread potato mixture into the dish. Sprinkle mixture generously with salt, pepper, and parsley. 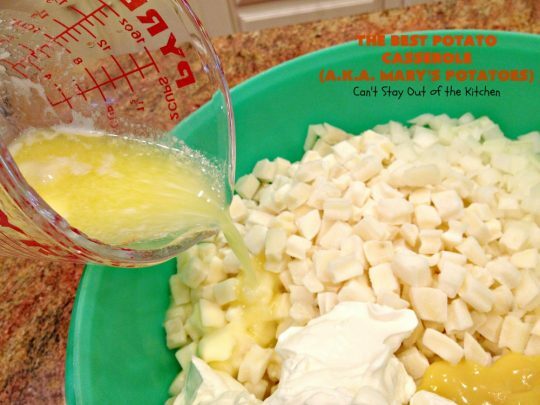 Melt butter in large measuring cup. Crush Ritz crackers and add to measuring cup with butter. Stir to combine. 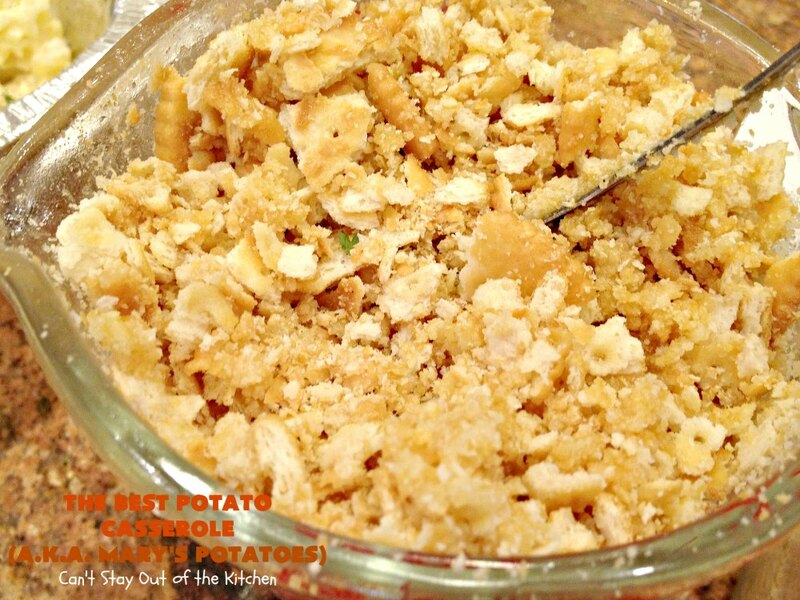 Sprinkle Ritz cracker crumbs over top of potato casserole. Bake, uncovered, about 1 hour at 350. 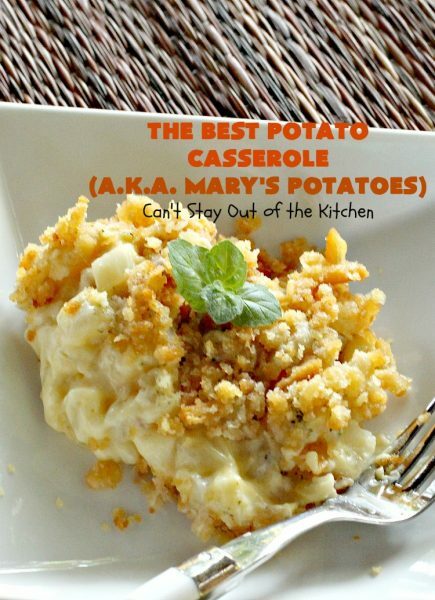 Mary’s Potatoes is one of The Best Potato Casseroles you will ever eat. 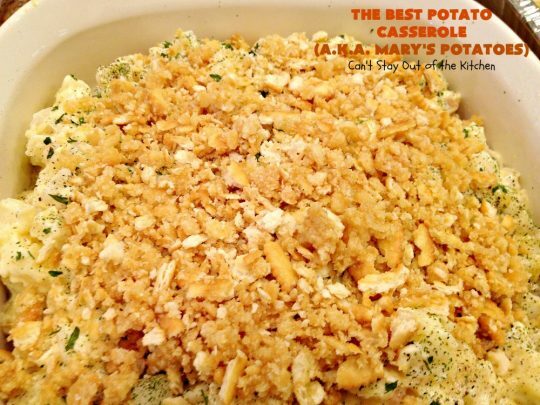 The texture of this casserole is rich, sumptuous, creamy, and chewy because of the potatoes and crunchy because of the cracker crumbs. 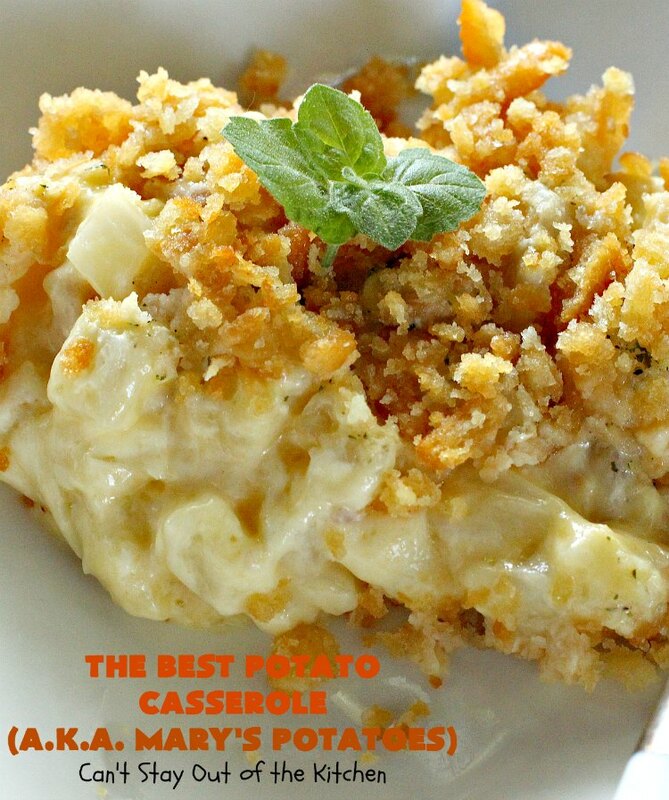 Mouthwatering potato casserole recipe with a fabulous Ritz Cracker crumb topping. Great for holiday or company dinners. Mix hash browns, soup, sour cream, 1 stick butter, and onion. Pour into 9x13” buttered casserole. Sprinkle top with salt, pepper and parsley. Crush Ritz crackers and add to melted butter mixing well. Sprinkle top with cracker mixture. Bake uncovered at 350° for 1 hour. NOTE: Ritz crackers has reduced the size of their sleeves of crackers. You may need to add about 1/2 package additional crackers from another sleeve to get the same amount. Pour into 9×13” buttered casserole. 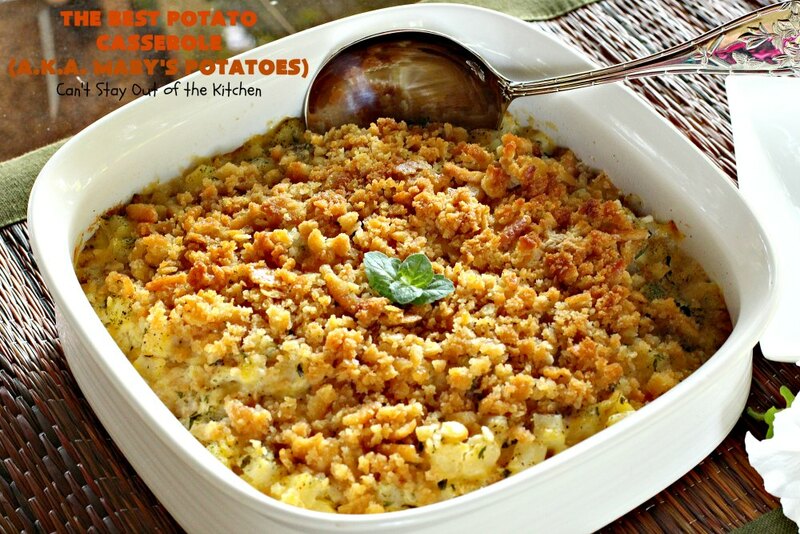 Doesn’t The Best Potato Casserole (a.k.a. Mary’s Potatoes) look wonderful? 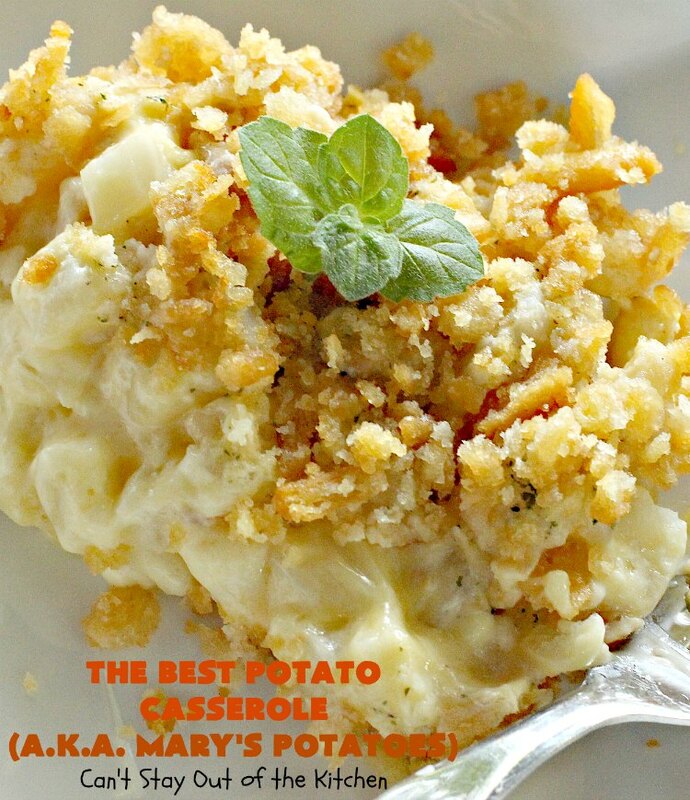 Are you ready for a scoop of potatoes on your plate? 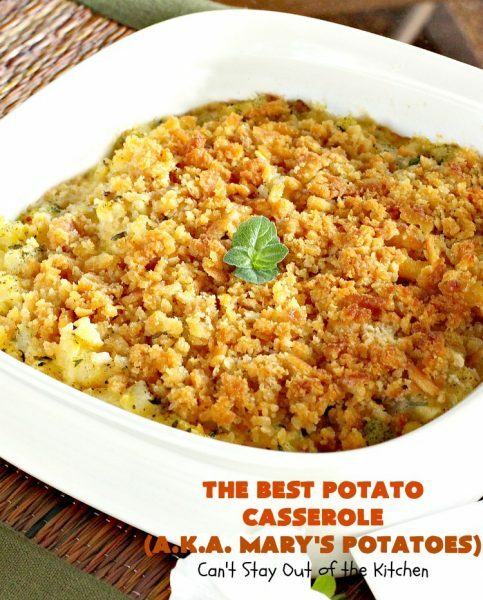 The Best Potato Casserole is a marvelous casserole for company or holiday dinners. Hi, this is the same recipe used here in the Midwest. 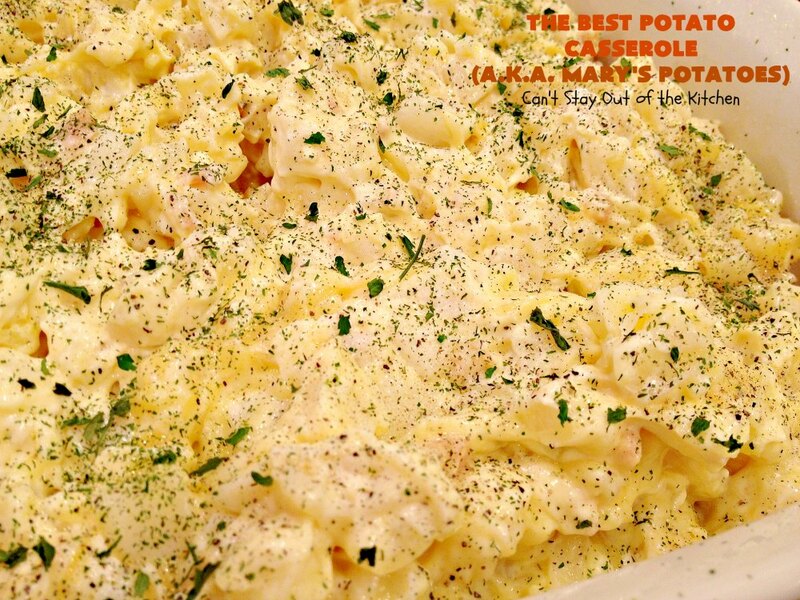 We tend to call them company or funeral potatoes. The name doesn’t matter. They still show up at all the potlucks, holidays, and funeral gatherings. The bringer always gets to take home an empty dish. Hi, Cindy. These really are the best potatoes ever. They go with just about any entree. Our family just loves them. Thanks for stopping by and letting me know.